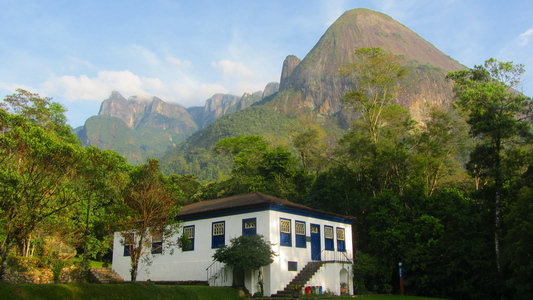 The main attraction of Teresopolis is the marvelous Parque Nacional Serra dos Orgaos with stunning shaped mountains like Dedo do Deus (God's finger) with altitudes up to approx. 2300 meters. It stretches Northeast of Rio de Janeiro along the coast of the Atlantic Ocean. It is part of the rain forest and consequently precipitation is huge. Two entrances into the park are close to Teresopolis with trails, natural swimming pools and good campsites. Between the two mid-sized cities of Teresopolis and Nova Friburgo is the scenic Tere-Fri circuit with gorgeous winding roads. Teresopolis is named after the Empress Maria Teresa from Habsburg. She was the wife of Dom Pedro II, the Emperor of Brazil in the second half of the 19th century for 49 years. Families emigrated from the Swiss canton Friburgo founded Nova Friburgo in 1818. The charming village Arraial do Cabo is one of the first settlement in America: Amerigo Vespucci landed here in 1503 and left 24 men. It is located on the beautiful peninsula Cabo Frio with islands, mountains, cliffs and beaches with clear and turquoise waters. In the southern part of the city is the main entrance to the Parque Nacional Serra dos Orgaos. The price for camping is reasonable and the entrance fee is zero for people over 60 years. It includes an information center with a Lady who speaks very well English. The campsite (GPS coordinates: S22° 27.234' W42° 59.546') is lofty with basins made by granite. It is not accessible by car but it has a good parking lot few meters outside, where we stayed totally alone for three days. We were not so lucky with the rainy weather but after the tremendous heat and drought in the North of Brazil we enjoyed the rain and coolness of 1075 meters sea-level. Despite the wet weather we hiked some trails in the dense jungle, for example there is a fabulous canopy walk to see the upper parts of the giant trees. The lower section Guapimirim of the national park has also a nice campground (GPS coordinates S22° 29.723' W43° 00.070') and some little walks. But we had better views, at least in the early morning. The more we came to Nova Friburgo the more the landscape became Swiss like with cattle, green meadows and huge mountains. Still there are some remains of the recent flood visible like fully eroded slopes, mudslides and broken houses. More than 600 people had been killed by this incident in January 2010. It was again a rainy day when we drove this circuit but we found there the most delicious cheese in South America in the Swiss dairy Queijaria Suica so far. Thanks to Maria and Hans-Joerg, we found the outstanding beautiful campsite in Mury, 15 km South of Nova Friburgo (GPS coordinates: S22° 21.304' W42° 32.132'). There is a trail through the jungle behind it. The rain forest became thicker and thicker the more we hiked North. After two hours a scraped car was close to the path and soon we arrived in a suburban of Nova Friburgo, where we took the bus into its center. Like Teresopolis Nova Friburgo is a town of 180,000 people without historical attractions. But there are good shops and many bars in its bustling center. In the evening we found also a bus back to our car. The peninsula and town Buzios is an ideal spot for bicycling. There are terrific beaches, stunning viewpoints and a glamorous center with many tourists, which we explored with our bikes despite the rain. Close to the center is the nice campsite including a shop and bar, where we had interesting discussions with the local people (GPS coordinates S22° 46.280' W41° 53.857'). The sun came back when we arrived in Arraial de Cabo (campsite close to the beach at S22° 58.394' W42° 01.366'). Here we hiked a little bit on the peninsula East of town. It is a marvelous and remote landscape but also a military area. We were lucky that a local man convinced the guard to let us in - People in Brazil are often very amazing and gentle.